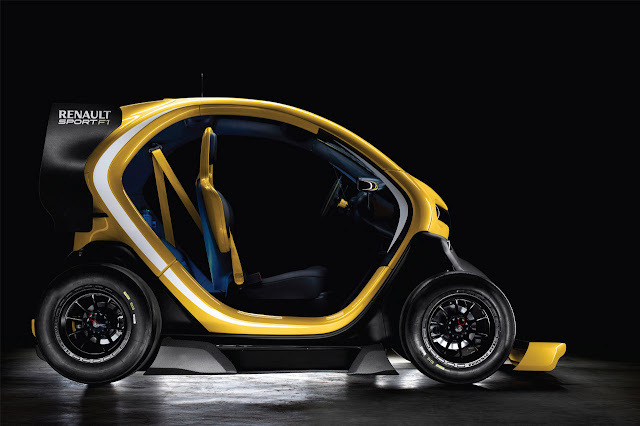 Twizy Renault Sport F1 will be shown at major events throughout the year, beginning with its first public appearances at the World Series by Renault meeting at Aragon, Spain (April 27-28), followed by the Barcelona Motor Show. Eric Diemert (Design Director, Renault Sport Range). In order to express the link with Formula 1 and the Renault Sport race car range, both Renault Sport F1 and Renault Sport Technologies contributed to Twizy Renault Sport F1’s design. Tarik Ait Said (Project Coordinator, Twizy Renault Sport F1). 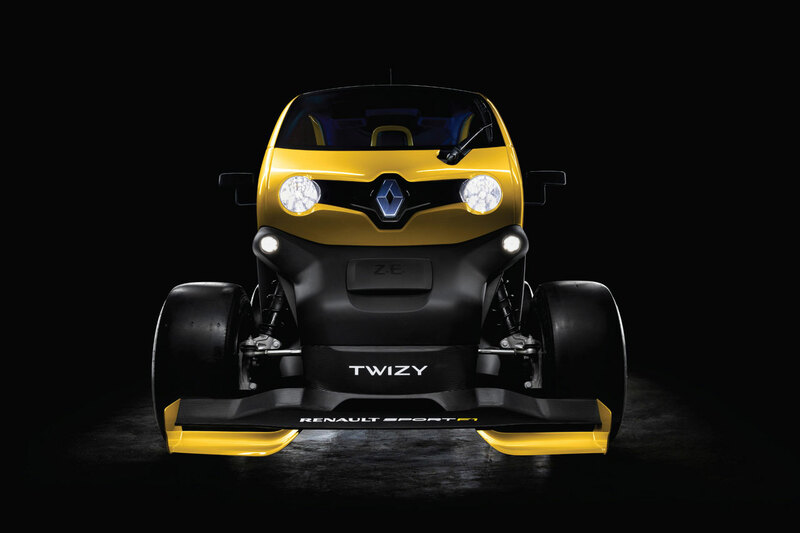 Twizy Renault Sport F1’s performance credentials are founded on the use of the KERS employed by Renault-powered Formula 1 cars. The KERS (Kinetic Energy Recovery System) is designed to recover some of the kinetic energy which is generated under braking. Instead of being lost in the form of heat, this energy is recovered and stored before being used to momentarily boost power output, just as it is in Formula 1. - An electric motor-generator unit (MGU) directly linked to the driveshaft. - A KERS Control Unit (KCU). As its name implies the motor-generator unit serves as both a generator and a motor. In ‘generator’ mode, it functions like a dynamo to convert mechanical energy into electrical energy which is then stored in a battery. To use this energy, it suffices to reverse the process. The system then switches to the ‘motor’ mode to use this stored energy to deliver a power boost to the wheels via the motor. Six times the power output! Twizy Renault Sport F1 is consequently equipped with two electric motors, i.e. Twizy’s original motor (17hp/13kW) onto which an F1-style KERS has been grafted to turn the concept car into a genuine pocket rocket with exceptional performance. When the KERS is activated, Twizy Renault Sport F1’s power output climbs instantly six-fold, from 17 to 97 horsepower (72kW). This boost is available for approximately 13 seconds, just as it is in the case of a Formula 1 car. Thanks to this additional power, the concept car is capable of accelerating from standstill to 62 mph in the same time as Mégane Renaultsport 265. It goes without saying that Twizy Renault Sport F1 isn’t as fast as a single-seater race car. As a consequence, the kinetic energy produced under deceleration is insufficient to charge the KERS’ battery. To get round this problem, the experts at Renault Sport Technologies and Renault Sport F1 developed a system that enables the battery to be charged by siphoning power from the main motor. This solution gives the driver total independence over how the KERS is used. The driver can choose between two modes for the KERS used for Twizy Renault Sport F1, using the controls located on the steering wheel. 1/ Recovery mode: with this mode activated, the electric motor functions like a conventional generator, drawing power like a dynamo to convert the mechanical energy produced by Twizy main motor into electrical energy. Up to 4kW can be siphoned off in this way to charge the battery while on the move. 2/ Boost mode: the energy recovered using the Recovery Mode can be re-employed whenever the driver wishes by pressing on the button located on the steering wheel. This reverses the process. Instead of serving as a generator, the KERS’ motor-generator unit (MGU-K) now functions as a motor to bring a power boost to the principal motor to which it is directly linked via the driveshaft. The maximum power output of the MGU-K is 60kW (approximately 80hp). The charging process and the way the stored energy is delivered are controlled by a control unit which is itself linked to Twizy Renault Sport F1’s ECU (Electronic Control Unit). When the system is triggered, the maximum revs of Twizy’s motor rise to 10,000rpm for a top speed of 68 mph. The fruit of advanced technology, the MGU-K fits inside a 10cm-diameter cylinder and can rev to as high as 36,000rpm. The KERS is equipped with its own battery capable of very short charge/discharge cycles. Derived directly from F1 technology, the package weighs barely 30kg, battery included. Given that the peak revs of the KERS and Twizy’s principal motor are 36,000rpm and 10,000rpm respectively, the connection between the two was one of the chief challenges of the project. Synchronisation is ensured by a 1:3.6 reducer gear which uses the same drive gear as that of the F1 V8 engine. The KERS uses a pressurised lubrication system to enable certain bearings to withstand peak revs of 36,000rpm. Meanwhile, in order to prevent the KERS battery from overheating despite the constraints to which it is exposed, Twizy Renault Sport F1 is equipped with water cooling. Both these systems are existing Renault Sport Technologies solutions. 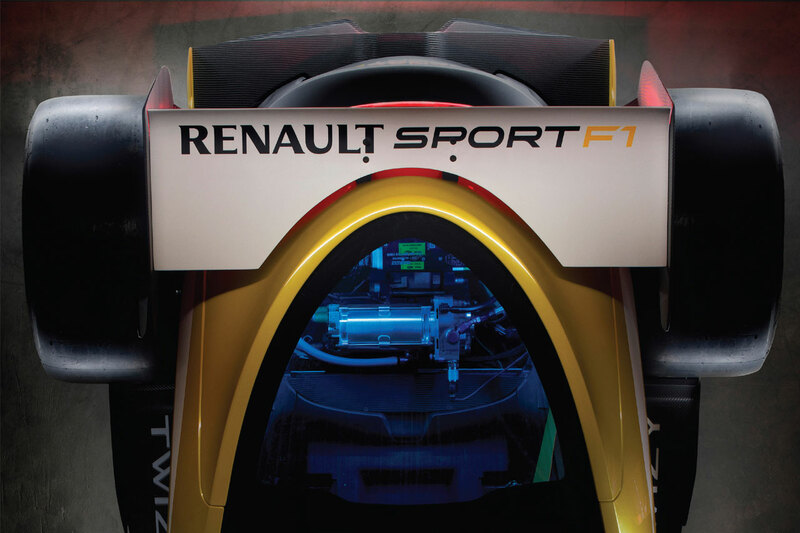 Twizy Renault Sport F1’s steering wheel is derived directly from that of the Formula Renault 3.5 race car. Its functions have been adapted for use on an electric vehicle equipped with KERS, while the rim is of a wider diameter. The amount of energy recovered while the Recovery mode is activated can be adjusted using the four-position rotary knob. Another rotary knob enables the power boost to be set at one of six pre-set levels, ranging from 10 to 60kW. The driver releases the energy stored by the KERS by activating the two steering wheel-mounted paddles at the same time. To show spectators that the system has been activated, the rain light incorporated in Twizy Renault Sport F1’s diffuser is switched on. The concept comes with its own data logging system, with information displayed on a multi-page screen situated on the steering wheel. This display can be personalised to show information concerning both Twizy’s and the KERS F1 electronic systems. A wide range of parameters can be displayed in real time, including the main battery’s level of charge, the KERS battery’s level of charge, oil pressure, water temperature, etc. Twizy Renault Sport F1 is also equipped with an ‘RS Monitor’ data logging system similar to the one available for Mégane R.S. and New Clio R.S. 200 EDC. This allows the driver to monitor a number of performance-related parameters in real time (0-31 mph time, 0-62 mph time, 50- and 100-metre standing start times). II. A KERS FOR TWIZY? GO FOR IT! An electric vehicle which benefits from the combined technological expertise of Renault Sport Technologies and Renault Sport F1. 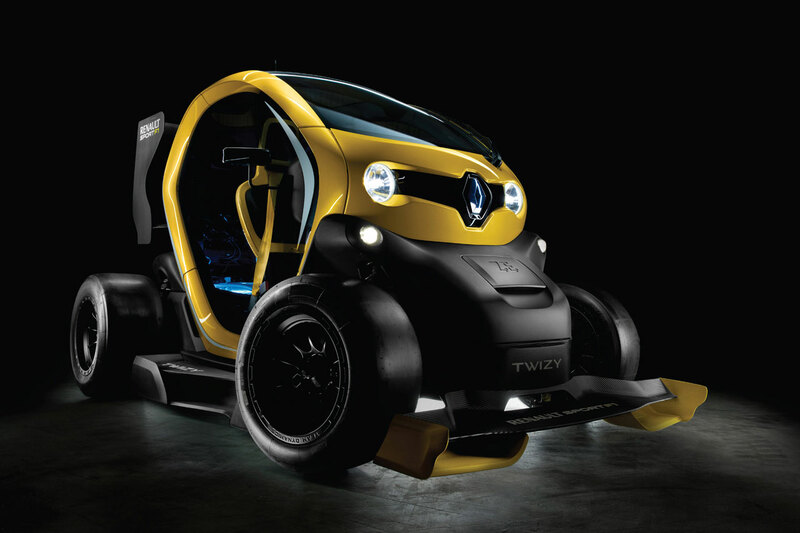 Renault Sport F1 and Renault Sport Technologies worked hand in hand to convert the KERS system for use on the Twizy Renault Sport F1 concept car and then fine-tune the resulting package. Throughout the project, the collaboration between Renault’s two sporting departments was exemplary, and the combination of their taste for a challenge, their passion for motorsport and their prior knowledge of Twizy was key to the project’s success. Based on an idea suggested by Renault Sport F1: thanks to the technological excellence it has acquired as a supplier of engines to a number of F1 teams, Renault Sport F1 wanted to communicate to a wider audience the savoir-faire it has built up in the realm of electric power thanks to KERS which became a part of the sport in 2009. Indeed, it was because of this very expertise that Renault’s F1 engine specialists were called in to play a part in the development of the standard Twizy’s electric motor in 2010. This grasp of the KERS used in F1 and of Twizy’s electric motor provided the perfect opportunity to bring the two worlds together. Between the end of the summer and late-November 2012, Renault Sport F1, Renault Sport Technologies and Renault Design met frequently to evaluate the technical feasibility of the different options with a restricted budget. Their findings were then presented to Renault’s senior management who gave the green light at the end of December. In less than four months, the idea was transformed into a project sanctioned at the very highest level of the company. - Supply of a production Twizy. - Chassis modifications and fine-tuning. “When Renault Sport F1 asked us to work on the project, our engineers didn’t hesitate. Renault Sport Technologies had already made a significant contribution to the design and development of the highly innovative Renault Twizy which meant that our input was perfectly natural. “Thanks to our experience of race car engineering, we were able to take elements from our FR2.0 and FR3.5 race cars and also check that the rigidity of Twizy’s chassis and suspension was capable of handling the additional 60kW. Patrice Ratti (General Manager, Renault Sport Technologies). Meanwhile, the experts at Viry-Châtillon brought to the table their integration savoir-faire and KERS expertise, including the battery, not to mention their experience of Twizy’s own motor. Twizy Renault Sport F1 serves as an exciting bridge between the world of Formula 1 and that of production cars in much the same way as Espace F1 which was unveiled at the Paris Motor Show in 1994. This prototype was the fruit of a partnership between Renault and Matra and was produced to celebrate the 10th anniversary of Espace’s launch. Its carbon fibre body was based on the design of the second-generation Espace. Espace F1 used the same 820hp RS5 V10 3,500cc 40-valve engine as that which powered the Williams FW15C F1 car. It drove through a semi-automatic six-speed paddle-shift gearbox and the car was turned out in a striking yellow livery. Comfortably strapped into bucket seats by three-point harness belts, the four passengers were able to enjoy a near-Formula 1 experience from the inside. 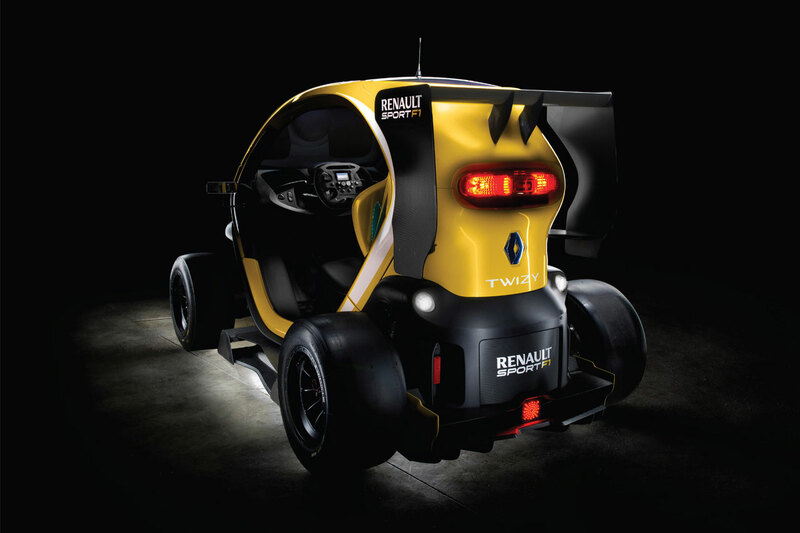 In addition to the fact that the two projects place the emphasis on ‘fun’, Espace F1 and Twizy RENAULT SPORT F1 both serve as eloquent illustrations of Renault’s desire to see production vehicles benefit from technologies developed for motorsport. Thanks to its 35 years of experience as an F1 engine supplier, Renault benefits from an exceptional technological laboratory which provides it with an undeniable advantage when it comes to developing vehicles of tomorrow.